Soothes the Liver, remove Liver Qi stagnation, remove Heat from Liver and Gall Bladder system. For alternating fever and chills, chest and rib-sides fullness and discomfort, a bitter taste in the mouth and dry throat, reduced appetite, nausea, vomiting, and irritability, hepatitis, jaundice, common cold, and cholecystitis. 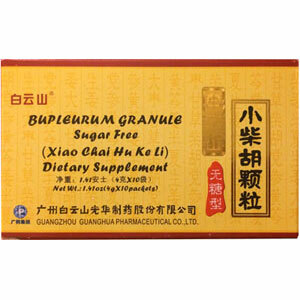 GuangZhou GuangHua Pharmaceutical Co., Ltd.
A traditional herbal supplement that helps promote and maintain a general well being by establishing the body’s natural balance. Together, these seven herbs have a remarkable synergistic effect that can be applied to a wide range of clinical presentations. Soothes the Liver, remove Liver Qi stagnation, remove Heat from Liver and Gall Bladder system. Alternating fever and chills, chest and rib-sides fullness and discomfort, a bitter taste in the mouth and dry throat, reduced appetite, nausea, vomiting, and irritability, hepatitis, jaundice, common cold, and cholecystitis. Take 1 to 2 packets 3 times a day.